Become a contributor and help us maintain Bioline International free to all! Bioline International provides a platform for the free distribution of bioscience research published in developing country journals. It is managed at the University of Toronto, Scarborough. Its online information system was developed and is maintained by the Centro de Referência em Informação Ambiental, CRIA, a nonprofit Brazilian organization of public interest. Thanks to its large success over the last 20 years, Bioline now disseminates more than 45.1 thousand articles from publishers in South America, Africa and Asia. Some 5 million full text downloads have been recorded over the last year, indicating its value to science. In order to recover costs and at the same time guarantee continued free and open access to all content and associated tools and free services to all publishers, we are introducing a new strategy to reach sustainability through donations. We therefore invite all those that consider this resource important for the progress of global science, to contribute with any amount you are able to donate to this initiative. Periodic reports of all contributions received and investments made will be posted on this site. For more information contact us at bioline@cria.org.br. 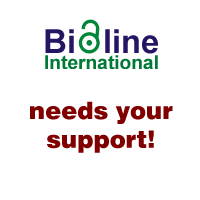 to keep 45211 articles in 87 journals from 26 countries available for free to all!